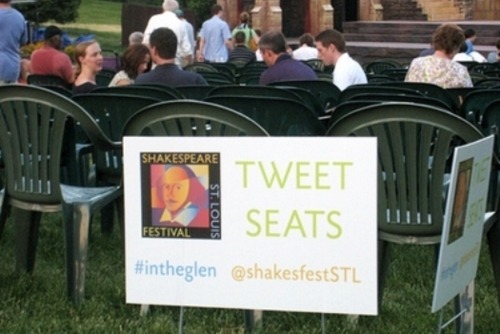 Love this article on how theatre venues, including the Cincinnati Symphony Orchestra, Raleigh's Carolina Ballet and Ohio's Dayton Opera, are beginning to incorporate seating for people dead-set on "livetweeting" highbrow cultural events. As PSFK mentions, this is a great way to introduce young, spendy techies to classical music, the opera and ballet. The only caveat: why stack them all in the back? I'd pack these guys into boxed seats or give them front-row space, maybe at a relative distance from the audience, to ensure they get a stellar experience. That's how you properly earn your earned media. Flash photography is a problem at these events, which is one reason why sites like Carnegie Hall or the Kennedy Center demand that patrons switch phones off (in addition to accidental ringing). Solution: make like the tech conferences and avail high-quality photos to people who have registered to the events as tweeters or bloggers.